Thursday 5th October 2017 We left Kanab campsite and drove on one of our favourite drives up through Orderville lined by beautiful autumnal cottonwoods and sparkling cold sun, then over the high plateau past Bryce canyon and onto Escalante town through stark but beautiful scenery. We asked at the ranger station about the state of Death Hollow river level as the river had defeated us last year with its deep, cold, fast flowing water. The ranger had one report of a team that had turned back recently at the crux narrows but we decided to head in anyway as the autumn has been dry and we expected the water levels to be reasonably low. We left the car at a windswept and dusty turn off about 2 miles west of the town of Boulder in mid afternoon at the eastern trailhead of the Boulder Mail Trail. Having hiked the west portion of this trail last year and finding it to be superb we were so glad to be back now on the eastern side. An easy hike to start on good trail winding its way through pinyon – juniper scrub before we dropped height onto slickrock and to cross Sand Creek with running water and lush cottonwoods, greenery and even some aspen. From there we continued west on slickrock before a bigger drop down rock into stunning Death Hollow. It was evening now and our thoughts were to finding a campsite before dark and we waded downstream in and out of the river of Death Hollow before finding the same site as last year on sparkling white sand on the canyon floor underneath ponderosas. Wonderful! Friday 6th October 2017 Now for the descent down Death Hollow to the Escalante which had defeated us last year. The river bed here is filled with hard wearing volcanic boulders in many places making for tougher going than many of the canyon rivers here abouts. That plus the ubiquitous outcrops of poison ivy along the river banks slowed us down initially. The scenery was superb though with towering walls and the green canyon floor filled with tall ponderosas. As we continued the going got easier and steady as we often followed faint trails on the banks between river crossings. The water warmed up into the day making the river crossings easier too. Often the bed of the stream was slickrock sandstone layer. It occasionally dropped off into potholes or deep clefts though such that we had to keep concentrating. We passed the junction of Mamie Creek which was a useful marker point and stopped for a bagel lunch on a beach with sparkling blue pools. Next up was a section of narrows which were exciting! The water roared through a subway shaped slot with rock overhead forcing us down to a crawl and a sloping slippery ledge under the water for feet. A mistake would have made for a cold swim but we both made it and from then on Death Hollow was more mellow but continually beautiful. Saw some canyon wrens, dippers, blue jays, woodpeckers, 2 snakes and a buzzard! We made it to the junction with the Escalante River at 3pm and noted that the Escalante had much less flow than Death Hollow. We continued down the Escalante with some trails, river crossings and bushwacking to camp near the Natural Bridge. What a great day! Saturday 7th October 2017 A cold night. Our shoes and socks froze overnight and we had a slow start waiting for the sun to hit us and thaw us out. We walked downstream along and across the Escalante river which was broader and more open here with sagebrush flats but still fringed by red rocky cliffs. We crossed Highway 12 and saw a few people here around the trailhead, soon leaving the road and people though on a good mellow trail. Stopped to watch a canyon wren dart about on the rock only a couple of meters away. It had a white breast and long curving beak- good for extracting insects from cracks in the rock? There are a few well marked river crossings but mostly this section of the Escalante down to Boulder Creek is easy and relaxing hiking. Golden cottonwoods lined the river. At Boulder Creek we hit a huge pile up of wood and flood debris which had formed a large island with rapids through the wood. Just beyond was a fresh downed cottonwood tree, with distinctive beaver teeth marks. Impressive! Half an hour later we found our exit point from the river on the ‘Brigham Tea Bench as described by the Steve Allen guide and stopped for lunch in the shade from the now hot sun at about 2.15pm. A faint trail climbed up rock slabs to a dessicated wooden ‘line shack’- an old cabin complete with an old bed and table. From there we headed north on a mix of sandy flatlands and swirly slickrock following a wide bench between the high escarpment on our left and the canyon of the Gulch on our right/east. It was hot and sometimes tiring on the sand but the wild atmospheric open views were a great contrast to the canyon walking. We decided to keep going into the evening to reach a series of rocky pools on the other side of a saddle on our western escarpment. Made it there to a wonderful campsite on a small patch of sand amongst rippled rock with a string of pools below us descending down the rock slabs. Crystal clear starry night and totally quiet- another great day! Sunday 8th October 2017 Warm still air in the morning (8C) and we left the tent to scramble up the creased slabs to the north. The slabs were too steep to be taken direct but zig zagging and following lines of weakness allowed us to reach the summit with multiple pinnacles. What a spot!- which didn’t look like it sees many visitors at all but with extensive views across this remote sandstone area with the higher slopes of Boulder Mountain to the north. Back at the tent we decided to also have a look at the water line dropping westwards before packing up and leaving the campsite. Numerous potholes and vegetated pond oasis’s made it another lovely area to explore. After a superb start to the morning we continued hiking north along the slabby eastern side of the dome escarpment until it faded away and we turned west to follow shallow washes into Deer Creek. Just before Deer Creek we hit an obstacle of a 30 foot cliff but after a bit of hunting around we found a slender tree trunk lying against the cliff and were able to shimmy down to the bottom. A bit more scrambling through bush, across Deer Creek then up walls on the west side aided by some juniper trees and we emerged onto a trail heading northwards upstream. Relaxed hiking past autumnal cottonwoods followed before we hit the Burr Trail tarmac road at a campsite and picnic tables. From here we hiked north west on the Burr Trail towards Boulder town on tarmac. Paved road is not our favourite hiking but at least the scenery out here made it very pleasant and there was very little traffic although a supported cycle group came past at one stage. Eventually we caved in and hitched back to the car beyond Boulder. But what an excellent 4 day loop, with lots of scenic interest, variety, scrambling and a few side trips. Recommended! Loop hikes in Utah’s Escalante by Steve Allen – the bible to the Escalante area, a brilliant guidebook and a must buy. But getting rather dated (published 1997). 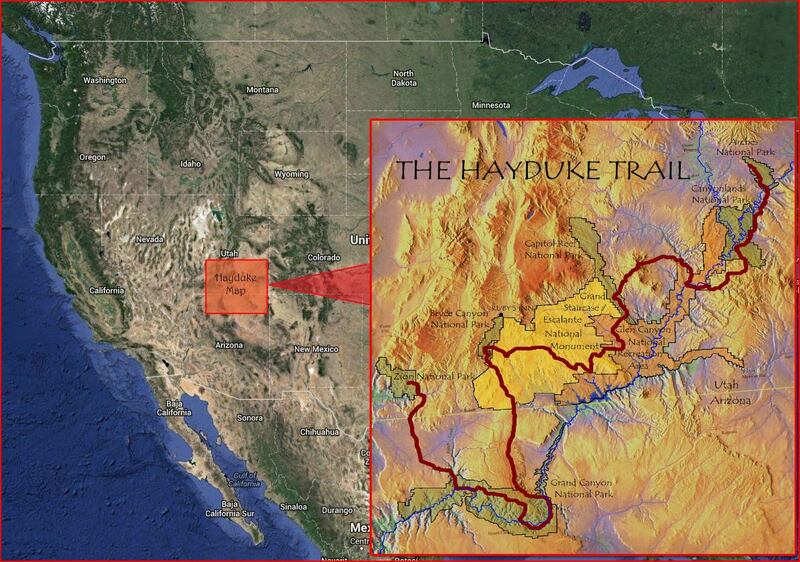 Jamal’s Across Utah description including part of this loop in a Hayduke alternate looks superb.